High Five Fiesta Adds a Little Something Extra to Your High Fives | OhGizmo! 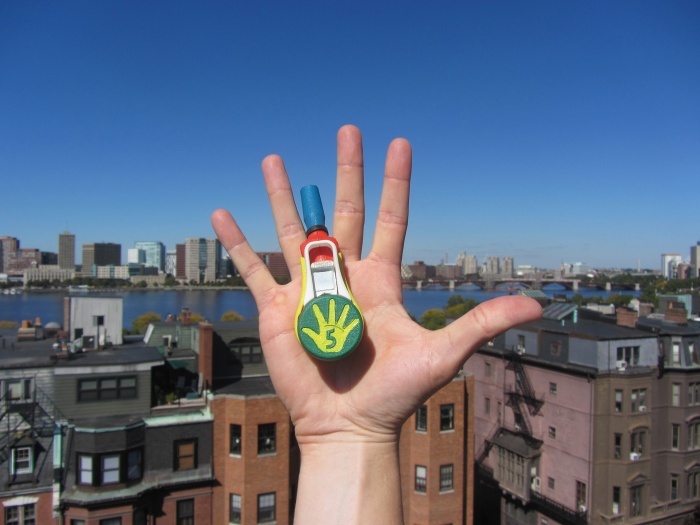 Add a little something extra to otherwise boring high fives with High Five Fiesta. It’s a small, handheld gizmo that shoots confetti into the air once its wearer gives (or receives) a high five. It features a reusable confetti cartridge which can easily be loaded with confetti when it’s all high-fived out. Some people might hesitate when they see the humongous green button on your palm when you raise your hand for a high five, but they’ll soon realize it’s pretty harmless and loads of fun when they do decide to meet your hand with theirs. High Five Fiesta isn’t available for purchase yet, although its creators will be launching a crowdfunding campaign on Dragon Innovation soon to fund its manufacture. You can check out their website for updates: Fiesta Five.